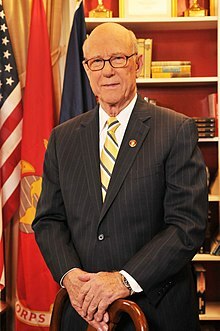 Charles Patrick "Pat" Roberts (born April 20, 1936 in Topeka, Kansas) is a senator from Kansas. Before Roberts was a senator, he was a U.S. House of Representatives member and the chairman for the United States House Committee on Agriculture. On January 4, 2019, Roberts announced that he will not seek reelection in 2020. ↑ "Kansas Sen. Pat Roberts not to seek reelection". WashingtonPost.com. 4 January 2019. This page was last changed on 10 January 2019, at 22:15.